The cloud-based G5 Gold provides access to DreamDraper from virtually any computer, tablet, or smartphone. Just log on and start designing. Includes 5 additional design collections for window treatments, bedding, and furniture. Free upgrades, secure daily backups. Fast, easy, accurate estimates, work orders, invoices, and client letters–on the spot. With pre-calculated yardages and prompts you won’t miss a thing. 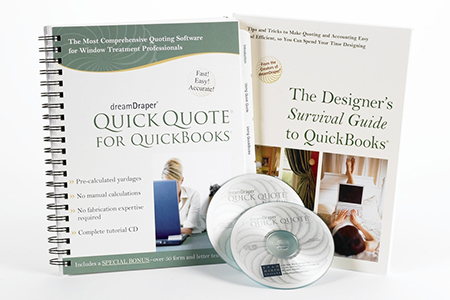 QuickBooks® version includes Designer’s Survival Guide to QuickBooks®. Also available for Design Manager software. Measuring Forms in our unique format help you measure with confidence and avoid errors and repeat visits. The Designer’s Survival Guide to QuickBooks® makes your accounting easy and efficient. The Fit-Like-A-Glove Slipcovers DVD helps bring new life to old furnishings. I am new to DreamDraper, but I am already in love with the software. I have a drapery customer who just could not envision what she wanted and didn't have the words to interpret what she wanted. I found DreamDraper just in time, and with its easy to learn tutorials, was proficient enough by our next day appointment to create draperies using swatches of fabric that she fell in love with and placed the drapery on her own room pictures. My customer said immediately, "Oh, I just so love this look! It came to life right before my eyes." She was SOLD! 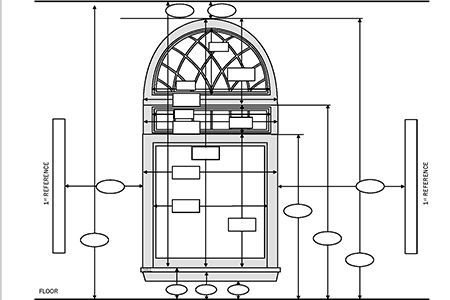 I have now created drapery schemes for her entry foyer, her dining room and her living room. Best software in the business!! Thank you, DreamDraper!! Cornices can be the finishing touch to a room - or even the solution to a problem! The Bedding 1 Collection expands your DreamDraper Design Library - and your business! A member of the DreamDraper community demonstrates how to realistically drape fabrics in a DreamDraper rendering.